Before I get to those two words, let’s review how Frederick Herzberg enlightened us with his two-factor theory about motivation way back in 1968. There are things in the workplace that motivate (e.g., achievement, recognition, work itself, etc. ), and there are things that if “not right,” can demotivate (e.g., company policies, supervision, work conditions, etc.). 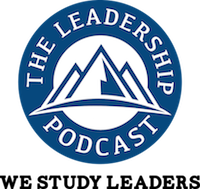 Thanks to this man – The Leadership Podcast exists! Episode 2 – Philosopher Tom Morris Tom is one of the world’s top public philosophers and pioneering business thinkers. He’s the author of 20 groundbreaking books and is a legendary speaker whose electrifying talks reengage people around their deepest values and reignite their passion for work and life. What Can You Learn About Leadership from Billionaires? What’s Coming on June 21st? !